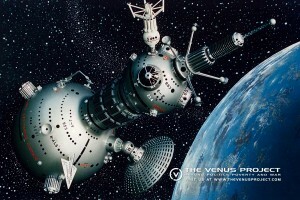 Space station concept model orbiting earth. Space stations provide the advantages of a gravity-free research environment. They can be entirely automated and self-contained to permit maintenance and self-repair without human intervention. These space stations would be able to monitor the earth’s resources, as well as facilitate further research in the fields of meteorology and astronomy, work that is often difficult on Earth due to atmospheric interference. Many other experiments can be accomplished in a gravity-free environment, particularly in the areas of medicine, chemistry, and metallurgy. In addition, these space stations would serve as nodes in a worldwide telecommunications system, providing up-to-date information on the Earth’s ecosystems, the position of ships and airliners, and other information pertinent to the inhabitants of the cybernated world.